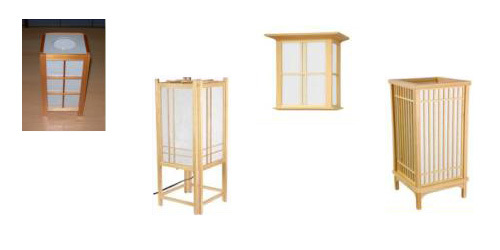 In western homes a Shoji screen is typically used to replace curtains, drapes and blinds, that is, in front of windows and patio doors. 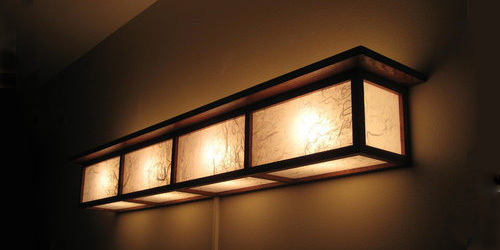 However, as the following photographs show, they can be used throughout a home. 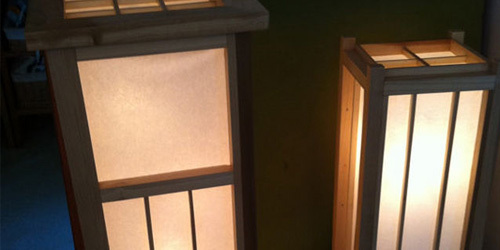 Traditional screens in Japan were made with rice paper, which had to be replaced every year. Other more durable materials are now also used, including fabrics, plastic sheeting, fibreglass and frosted glass. I favour fibreglass because of its strength, long life, and ability to withstand exposure to sunlight. Fibreglass sheeting is manufactured to have the appearance of the traditional papers, allowing filtered light to pass through the screen. The photograph at left shows two types of installations, both screening sliding glass doors, which are exposed to sunlight during part of the day. The screens to the left slide on timber tracks, and can be slid out of the way completely to give maximum light when required. 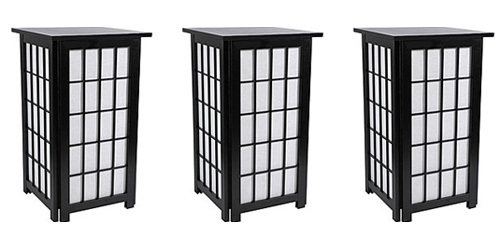 The other screen is made up of four panels arranged in hinged pairs to form a bifold screen. The pelmet conceals a track, and the pairs can be folded to each side to expose the view. 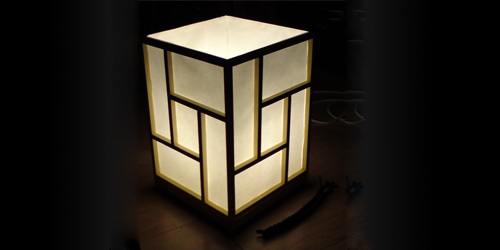 The members which make up the lattice pattern in shoji screens are called Kumiko, and there are many patterns used. You can even design your own! 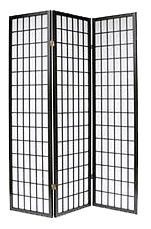 Shoji screens can also be used as mobile partitions. Some further installation options are shown below, but please don't let these images restrict your imagination. 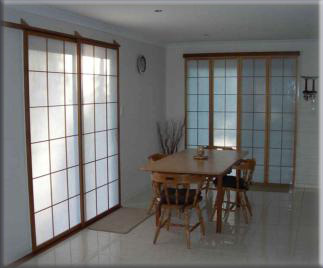 I custom build Shoji screens to suit your particular requirements, so give me a call to discuss your needs. 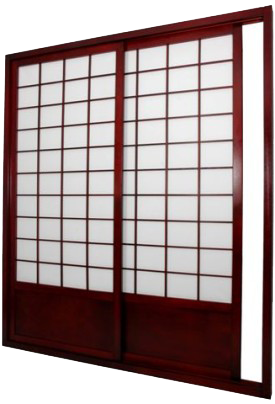 Fixed, sliding Shoji screen installation for doorways, windows, cabinets, and more. 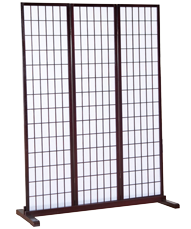 Hinged Shoji panels, used as mobile screens in the home or office. 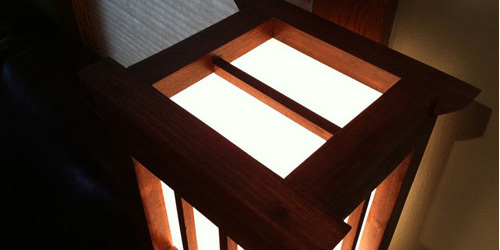 Single Shoji panel with base supports. 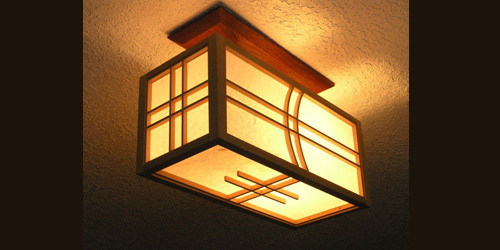 In addition to using Shoji screens for doors, windows and partitions, I can also apply the same techniques and effects to other items, including floor lights, lamps, wall light fittings, and many others. The following images might provide you with some inspiration. 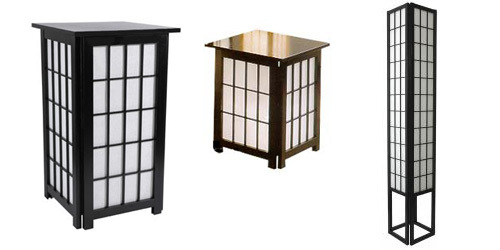 Depending on your needs, most pieces can be built to accommodate either candles or electric light bulbs. By Denis Murray.